Watch my first produced television news story for CBC News Vancouver. I totally thought of, found, set up, organized, produced, and even conducted the interviews for and with Theresa Lalonde, who wrote, edited, and reported the story. It was incredibly stressful to pull off, but ultimately very satisfying. The story is about Vancouver restaurants using social media and features Acme Cafe and LetsGoForDinner.com. I was even recognized during the shoot. "Comfort food done right." That is the motto for this retro Gastown diner. 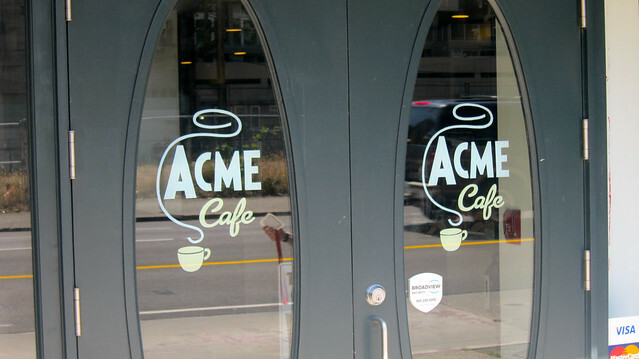 I finally got around to eating at Acme Cafe. I had been dying to try it for months ever since I heard the positive buzz online. After shooting the CBC news story about restaurants using social media there on Friday, I had to come back the next day and finally dine there. First of all, the restaurant is just plain cool with the nostalgic, retro style. Ironic, since the story was about how Acme is using new media to gain a following with many of the customers taking photos, blogging, and constantly tweeting about the restaurant and its food. So much so that I was recognized while shooting the story, had my picture taken, and tweeted online. Owner Alan Hoffman is genuinely one of the nicest, most down-to-earth people I have met. When I cold called him doing research for a possible interview, he was incredibly warm and friendly. We chatted about food, restaurants, and technology for 30 minutes. I am not naive, surely he appreciated the opportunity for free and positive publicity, but nonetheless, he could not have been nicer or more flexible about everything and it made me only more hopeful to work out the story and give them some good press. 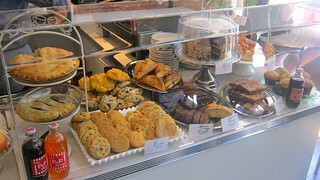 I really like the open space with the kitchen in the middle of the cafe with a take out area and baked goods display on the side. There's a cool diner area and a wall of booths. 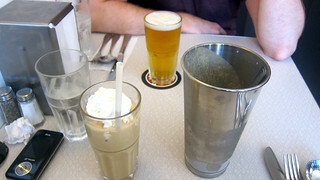 To start, I had the espresso milkshake which was delightfully smooth and tasty. 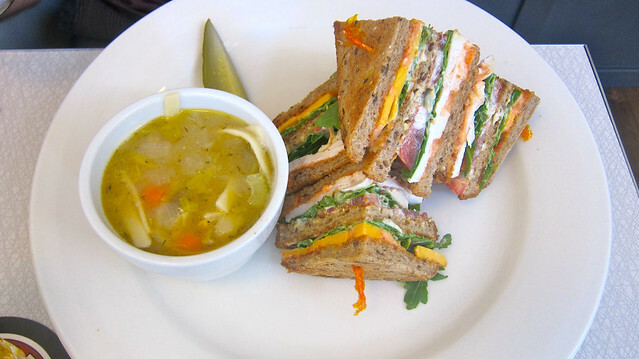 The turkey sandwich was comfort food at its best. 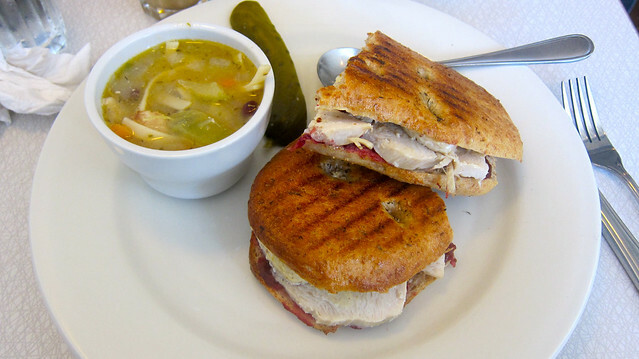 I love grilled sandwiches and the cranberry sauce and melted cheddar accentuated the flavour of the meat. The crispy taste and crunchiness made it quite delicious. The cup of chicken noodle soup on the side was tangy and flavourful. 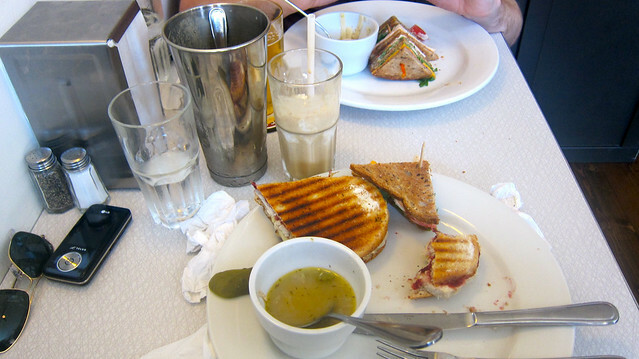 Chris, my dining partner, had the chicken club sandwich which was filling and scrumptious. There's not much to say about it, it was a good, solid take on a classic sandwich mold. Acme Cafe take all their standard meals and add a touch of personality with their homemade recipes and attention to detail. 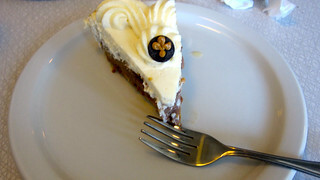 I had the peanut butter chocolate cream pie which was really good. I love cream pies and the filling was zesty. 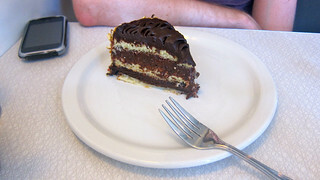 Chris had some sort of fancy pants layered chocolate cake that he described as quite rich and decadent. Alan told me all they pride themselves on making their own pastries and desserts from scratch with family, homemade recipes and that they have their own dedicated pastry chef. 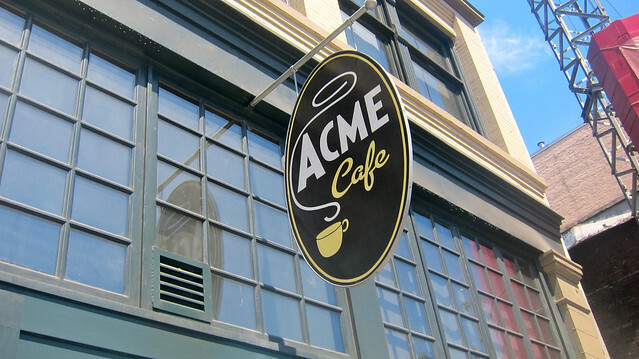 Ultimately, what makes Acme Cafe a treat is its personality, along with its friendly staff, interesting decor, character, and attention to detail. It is clear that mom and pop owners Alan and Peggy Hoffman have cultivated very carefully every aspect of their eatery to reflect their own sensibilities on food and atmosphere. Their successful online presence is simply an extension of their friendly attitudes. It shows, reflected in the restaurant with spades and if their popularity and notoriety after only a few short months shows anything, it is that Acme Cafe's high reputation is only building beyond their Gastown neighbourhood.